NEW YORK -- A New York Police Department social media effort backfired horribly Tuesday when Twitter users began posting photos of apparent police brutality. 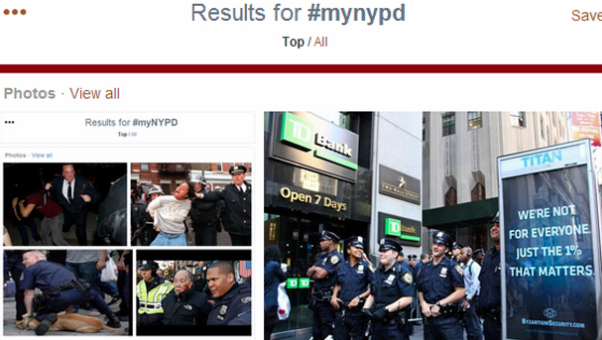 The NYPD's official Twitter account asked people to post of themselves with members of the Police Department using the hashtag #MyNYPD, Alex Silverman of WCBS radio in New York reported. But some Twitter users hijacked the hashtag and posted photos of a cop yanking a woman's hair, an officer with his knee on a shirtless man's neck, a lieutenant with his arms around a gasping woman's chest, among others. Police Deputy Chief Kim Royster released a statement Tuesday night saying: "The NYPD is creating new ways to communicate effectively with the community. Twitter provides an open forum for an uncensored exchange and this is an open dialogue good for our city."